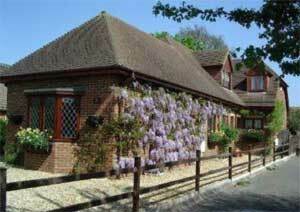 Wisteria House is a comfortable, newly furnished guest house in stubbington, near Fareham in Hampshire offering bed and breakfast accommodation. All bedrooms have en-suite bathrooms and are located on the ground floor. Bedrooms also have remote control colour television with video and teletext, radio alarm, coffee and tea making facilities, hairdryers and full central heating. For your comfort and safety all rooms at wisteria house are non-smoking. The guest house is conveniently located on the edge of stubbington village just a 3 minute flat walk to all local amenities and approximately 1 mile to the beach and coast at lee-on-the-solent, where you can enjoy panoramic views of the isle of wight. Wisteria House is ideally placed for access to the M27, approximately 4 miles to Junction 9 Segensworth West and Junction 11 Fareham Central.